NC Canals… Do you ever find yourself staring at an old map and wondering, “Where on earth did this map come from?” That question was recently prompted by a small undated map with no publisher imprint. 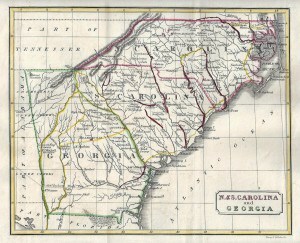 The map is titled N. & S. CAROLINA and GEORGIA. A search by map title quickly leads one to the David Rumsey Collection, where an earlier state of the map can be found. The first state, without canals and without the Dismal Swamp, was included in The Juvenile Atlas or a Series Of Maps, To Illustrate the Old and New Worlds, published by H.C. Carey & I. Lea, Philadelphia, 1822. This map was engraved by Young & Delleker, and likely drawn by John Graeme Melish, the son of the well known early 19th century cartographer and publisher, John Melish. The maps in The Juvenile Atlas that were engraved by Kneass (rather than Young & Delleker), credit J.G. Melish as the “delineator.” Based on the consistent style despite multiple engravers, it is logical to assume that all maps were drawn by the same person. This first state of the map has an engraved “No.32” at the top left corner of the plate, a feature lacking on subsequent states of the map. 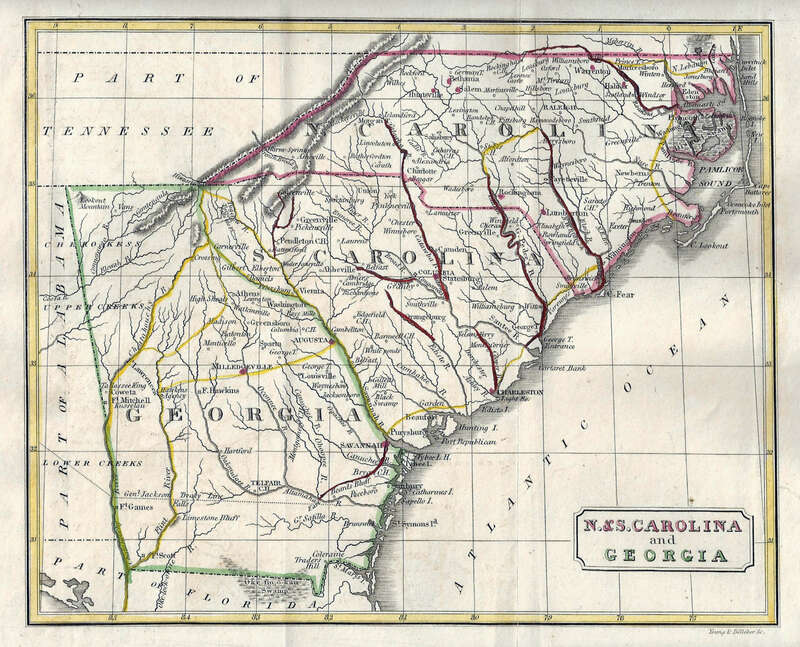 One of the most noticeable features of our “unknown” map above is the indication, by engraved dotted lines and yellow and red handcoloring, of a network of canals connecting rivers and/or sounds in North Carolina. One such canal is seen arcing southward from Plymouth, on the Albemarle Sound, to Beaufort. A Google search, without the brackets, for [canal “Albemarle Sound” Plymouth Beaufort] provides links on the first page of search results to the 1826 and 1830 editions of George Armroyd’s A Connected View of the Whole Internal Navigation of the United States … Fortunately, both editions are digitized. Although the 1830 edition provides a more detailed description of the proposed Plymouth to Beaufort canal, that edition contained only a single map of the United States. The 1826 edition is the source for our “unknown” map, a revised second state of the plate used for The Juvenile Atlas. Revisions to the plate include the erasure of “No.32” from the top left corner, and the addition of Dismal Swamp and the dotted lines indicating proposed canals. L. A. Key: The cabinet atlas, or a series of maps to illustrate the old and new worlds (1830); Philadelphia. U. Hunt: The cabinet atlas, or a series of maps to illustrate the old and new worlds (1830), Philadelphia. C. S. Williams: A new general atlas comprising a series of maps representing the grand divisions of the globe : together with the several Empires, kingdoms & states in the world (1832); New Haven. Andrus & Judd: A new general atlas comprising a series of maps representing the grand divisions of the globe : together with the several Empires, kingdoms & states in the world (1833, 1834); Hartford. If anyone has one of those atlases available, please let us know whether or not it contains this particular map. You can use the “What’s on your mind?” comment box below. State 1: Engraved “No.32” at top left, just outside neat line; Dismal Swamp is not shown; proposed canals are not shown. State 2: “No.32” has been erased; Dismal Swamp and proposed canals have been added. State 3: Additional place names, examples of which include Franklin and Waynesville; “piano key” border added. Do either of our two blog readers have a mystery map to be identified? This entry was posted in 19th Century, Cartobibliography, NC Transportation and tagged canals, John G. Melish, John Melish, north carolina maps, north carolina transportation by crmaps. Bookmark the permalink.